Ever since I was 16 and had a permit to drive I’ve had a car. Until now. In July of 2010 I moved from humble little Houghton in the Upper Peninsula of Michigan to Stockholm, Sweden, the self-proclaimed “Capital of Scandinavia.” The reason for the move is to complete a Master’s degree in Sustainable Energy Engineering at Kungliga Tekniska Högskolan, the Royal Institute of Technology. As you might expect, I’m a tree-hugging, eco-freak who wants to make things difficult for us Americans by suggesting we might have to change a few things about how we operate if we are to continue to enjoy the planet as we’ve known it for the past one million years. While I consider sustainability a holistic problem, transportation is an easy target but far from an easy topic. In the quest to find out what sustainability is, and how to achieve it, I have come to Sweden with an experiment in mind. 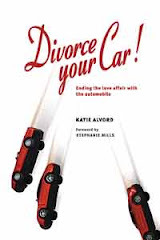 As we left the U.S., both my wife Melanie and I divorced our cars. Not too surprising since we didn’t want to let them sit idle for two years and they were too big for carry-on. But the real challenge will come when we return home. Will we be able to avoid a shotgun wedding? It’s a particularly challenging notion since we plan to return to Houghton, a rural town designed around motor transport and 270 inches of annual snowfall. The idea is that while here, we can learn how to adapt to public and non-motorized transportation as a regular way of life. Then, upon our return, we can use that experience to continue living car-free. It's much easier to get off the drug when you don’t have access to it, and this is how we hope to get clean. So, let me introduce you to the rehab center. As one might expect, it is quite easy to not own a car in Stockholm. Stockholm County manages a vast transportation network, consisting of an underground rail system known as tunnelbana, buses that criss-cross the entire city and county, several light rail commuter trains that extend into the suburbs and rural towns, and even commuter ferries that dock downtown. This system can all be accessed with a single card and for very reasonable prices. As a student I am offered discounts, so I can travel as much as I want for as little as $2.15 per day. But even the average adult can travel for $3.30 a day, still a very reasonable price. Oh, and all of the buses run on either biodiesel, ethanol, or natural gas. It’s a part of the city’s goal to be fossil-fuel-free by 2050, but more on that in later installments. 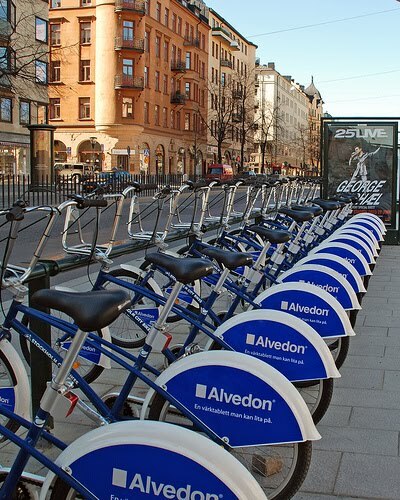 In addition to the motorized public transportation, the city runs a bike-share program similar to systems in Copenhagen, Amsterdam, Portland and Minneapolis. 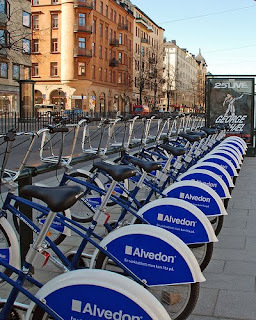 There are stations set up all around Stockholm where you can check out a bike, use it for up to three hours, then return it to any other station. This service can be used for 200 SEK, or around $28 for an entire seven-month season. And you never have to worry about any of the costs of storage or actually owning the bike. Once you have a bike, it is a breeze to get around town. The city is covered in bike paths, many of them completely separated from the road; often they have their own intersections and stop lights. Even when you don’t have stop lights, cyclists -- and pedestrians -- are always given the right of way at road crossings. And speaking of pedestrians, there are sidewalks everywhere! When we first arrived, we thought we would have to avoid major road intersections in the city, expecting massive car infrastructure with no pedestrian access. That’s how it is at home, right? Not so here. The pedestrian infrastructure is just as significant as the auto, with hundreds of people making use of it. It’s quite refreshing, really, the city is very considerate of all forms of transport. To be certain, there are lots of cars in Stockholm. 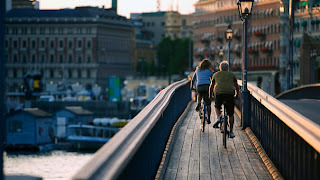 Almost 300,000 of them are in use in the city according to the 2007 Stockholm City Research and Statistics Data Guide. 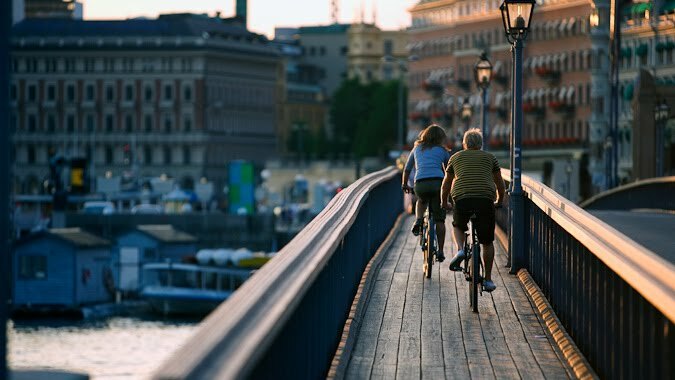 The traffic congestion can get quite tough during the mornings and evenings, enough so that Stockholm was ranked as one of the 20 worst cities to commute into (by car) in a 2010 IBM survey. In 2007, the city implemented a graduated toll system at all major inroads, charging more for entries during the busiest times and gradually less for less busy times. The highest tolls are 20 SEK, about $3.00, and you get charged going in and out. Then once you make it into the city, an annual parking pass can cost you 5000 SEK, which is roughly $2.50 per working day. The revenues generated by the tolls are to be used to maintain and improve roads in the city. In fact, one of the hot topics for this year’s national election (which just ended earlier this month) is the proposal of a highway tunnel that would travel north/south all the way under Stockholm to act as a bypass and reduce traffic through the city center. The party in favor of it won. So with all of the options available, you would think that transportation here is easy, right? Well, sometimes yes and sometimes no. 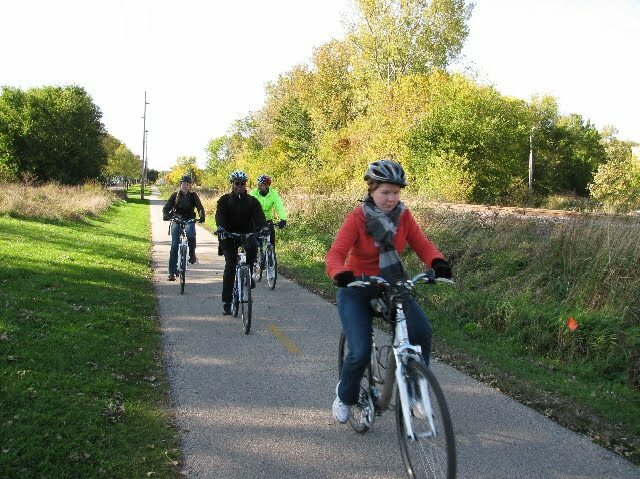 I, much like many eco-freaks, would like to see more investment in diversifying America’s transportation system: build or expand light rail, add bus routes and improve bike paths. So naturally, living in Stockholm is a very exciting opportunity to be able to come into a very mature and diverse city transportation system. I will be writing several more installments here on the Divorce Your Car blog reporting both the ups and downs of my experiences in going car-free, and hope it will help paint a better picture in your mind of sustainable transportation systems and maybe give you more ideas about how to divorce your car. Happy World Carfree Day! 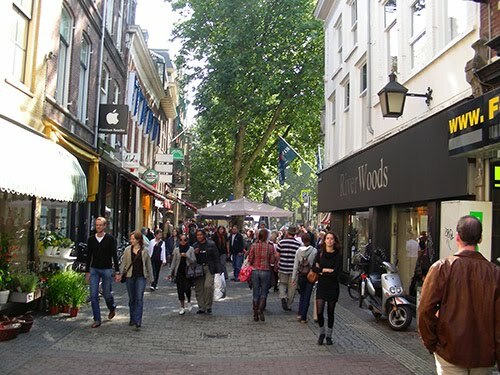 Cruise the international news online, and you'll find evidence of some of the roughly 1,000 Carfree Day events being held today in a reported 40 countries around the globe. Hong Kong's mayor, for instance, left his limo in the garage this morning and walked to work - a distance of only about 300 meters, but hey, it's significant that he took part. Elsewhere, three thousand cyclists pedaled in a mass bike-ride held in Taichung, Taiwan; Curitiba, Brazil, had scheduled events throughout the day; Vienna planned street parties; and groups in the U.S., including in Chicago and Washington, D.C., encouraged motorists to leave their cars at home. 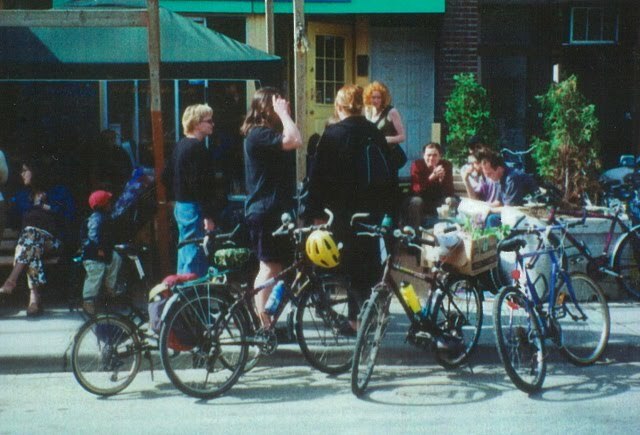 Since 2000, September 22 has been recognized around the globe as World Carfree Day. Events organized to celebrate the day aim to demonstrate the advantages of car-free living. The hope is that this will encourage the adoption of more car-free days throughout the year and more sustainable transport overall. As I write this, World Carfree Day events are underway in scores of countries and communities; some organizers have posted links on the World Carfree Day Facebook page while specific cities, including Toronto, Mumbai, Wellington, New Zealand, and Metro DC, have their own Facebook listings; and there has even been an odd attempt to organize counter-demonstrations, as reported by Sarah Goodyear in Grist. I'm out in the boonies, so I plan to celebrate by staying out of any motor vehicles today and taking a long walk in the autumn woods near our house. I've marked this day, too, by renewing my support of the World Carfree Network. I'm also prepping to do something new on this blog: for the first time, I'll be hosting some guest blog posts. 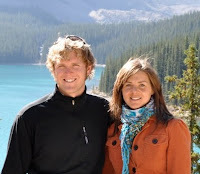 For starters, I'm very excited that Nelson Sommerfeldt will be guest-blogging here about his recent "Transportation Transformation" -- he and his wife Melanie Johnson Sommerfeldt just went car-free as they moved from car-dependent Houghton, Michigan, to bike-and-transit-friendly Stockholm, Sweden. Nelson and Melanie hope to continue this car divorce not only throughout the two years they're in Sweden, but also after they return to Michigan. A post from Nelson is coming up next, so stay tuned! The scenes of car-free living above are from Madison, Wisconsin (photo credit: Katie Alvord); Utrecht, Holland (photo credit: www.pedbikeimages.org / Ryan Snyder); Houghton, Michigan (photo credit: Mary Been); and Toronto, Canada (photo credit: Katie Alvord).